Unfortunately, there is and always has been a lot of tension between marketing and sales professionals as they compete to claim responsibility for revenue growth. In extreme circumstances, it’s similar to a corporate version of the Hunger Games. (Potentially entertaining, but unproductive) Stand down folks. What you see as your enemy is actually your biggest ally. We know; you have different selling perspectives. So naturally, it’s hard to get along right? Marketers focus on processes and analysis. Sellers focus on relationships and facetime. However, what you may fail to realize is that both departments have much more in common than you think. It may be reached in different ways, but the end goal is exactly the same – business growth. A little healthy competition can be beneficial, but an alliance is where the real power lies. The day is saved only when both parties understand and appreciate the power of a partnership. Marketing and sales teams need to begin to recognize how much stronger they can be with inside and outside support. The ideal dynamic is about creating a culture of shared success and celebrating big and small wins together. It’s time to get past the egos. Some of the most famous partnerships in history are only famous because they were partnerships. What would Tom be without Jerry? Bonnie needs the support of Clyde. Simon doesn’t sound too good without Garfunkel. And last but not least, Batman can’t save the day without Robin by his side. Let’s first talk about the differences in marketing and sales and then how to get past those differences to form your own dynamic duo. The sales team is a group of the on-the-ground, front-line heroes. The sales department is responsible for managing accounts and personal selling. This means ensuring that current accounts remain customers and then also following up with leads and prospects to encourage further consideration. The marketing team is a group of behind-the-scenes detectives. Ultimately, the marketing department is responsible for generating and nurturing quality leads. This concept can be broken down into two categories. The first category is the research. Market research and competitive analyses tell the company where they stand in the market. The second part is the communications piece. Marketing works to develop strategies that generate buzz and communicate an intriguing message. 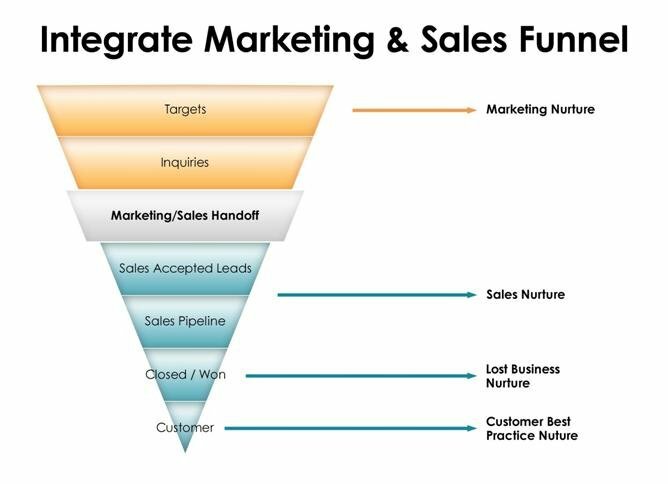 Above all, the first step in marketing and sales integration is ensuring that goals and standards are properly aligned. We already know that there are shared goals, but it is also crucial that both segments understand the company culture and mission. No matter what side of the fence you claim, both departments need a unified message. The imagery and communications created by the marketing department should match key selling points and buzzwords used by the sales team. High level values are important to establish, but process is the glue that binds marketing and sales together. Process often requires a great deal of detail and planning. To successfully integrate, there has to be an established method that allows sales and marketing teams to define leads, qualify leads, and assign them to a representative. Without a defined process, there’s only one outcome: chaos. More often than not, chaos is far from productive. In the end, it’s your job to put the customer above all else. Trust is established through shared goals. Both departments ultimately work in service roles. Embrace that mindset. Open and regular communication is the best way to stay aligned.